This entry was posted on February 5, 2015 by Posturite. Not long to go now before the first of two important events that we’ll be at in March opens in Birmingham. 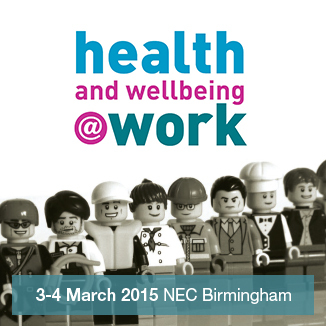 Health & Wellbeing at Work takes place at the National Exhibition Centre on 3-4 March. We’ll be there on Stand 83 with some of our market-leading ergonomic products as well as a whole raft of our top-selling health and safety e-learning training programs, so if you’re coming along we hope you’ll call in to see us. Later in the month, on Tuesday 24 March, we’ll be at Teesside University, Middlesbrough, for a free half-day seminar on ‘Reasonable Adjustments’ being organised by the local branch of IoSH. The two-day Health & Wellbeing at Work conference and exhibition, now in its ninth year, has become a must-visit event for HR and occupational health professionals, rehabilitation and therapy specialists, disability employment advisers, ergonomists and other professionals responsible for the environment, health and wellbeing of working-aged people. It will provide you with lots of new ideas and resources to ensure your employees are engaged and motivated, healthy, resilient, able to return to work quickly following absence and stay in work. In addition, David Kirtley from our Office Environments division will be speaking on the highly topical subject of sit-stand desking at a 1.50pm seminar on the event’s opening day, while Katharine Metters, our chief ergonomist, will be one of the expert panellists taking part in the Sit vs. Stand debate on the second day at 3.50pm. Katharine will also be one of the main speakers at the Teesside IOSH seminar on the 24th joined there by Keith Land, a partner at Sintons Law; occupational health specialist Margaret Murray from Engage OH; and Dallas Newton of North Yorkshire Physiotherapy. Together they will try to unravel some of the mysteries and answer some of the main questions surrounding the whole subject of ‘Reasonable Adjustments’. For example, what constitutes ‘reasonable’ in this context? How far do employers have to go to meet the individual’s needs? And if an adjustment is not made, could it result in litigation? With one in five people of working age in Great Britain classified as disabled, this is an important subject for all employers. Many disabilities are not always obvious. For example, impairments such as back pain, dyslexia, migraines and asthma can count as a disability if the adverse effect on the individual is substantial and long-term. The seminar will explain the responsibilities employers have to try to accommodate individuals so that they are not discriminated against or disadvantaged in the workplace because of a disability. The event runs from 10am to 12 noon, followed by lunch and an opportunity for networking. To reserve your place(s), email [email protected].